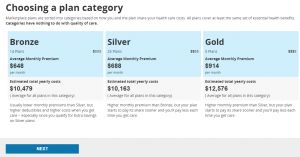 What are the steps on the Healthcare.gov website? B. must be one of the people who pays an inflated premium so people in A get a subsidy. Lest we be accused of being cynical, we must admit… it really isn’t magic. The “magic” number is $47, 520 for an individual. What does this mean? As an individual, your income must be between $11,880 and $47,520 in order to qualify for a subsidy. A married couple would need to have joint income between $16,020 and $64,080. A family of four, between $24,300 and $97,200. And so on. The subsidies can ne hundreds of dollars per month. But earn $1 more than the limit and you get nothing. Great system, huh? It actually encourages people not to earn more. What level of medical care do you think You will use this year? It may seem to make no sense to you; estimate how sick you plan to be and whether you will have an accident or illness. But that’s what you do. Guess how often you will need to go to doctors. Try medium if you have no idea. Yes, that’s correct, a monthly premium for 1 person ranging from $648 to $914 per month. A family of 4 can easily be $2,400 to $3000 per month. No you get to select your plan!